As a reaction to the hoard mechanic update last week, there has been some fine tuning today! The Pixpet potion costs stay the same, however it is now 30% more effective! It is now not possible anymore to receive void graded items trough hoards. The minimum grade has been set to 1. If you were brewing a potion while the recipe was changed and you received a potion of failure, please contact a moderator. They will restore your potion! Thank you! I thought the pixpet potion just guaranteed an egg found on the hoard when used, what does this +30% effectiveness apply to? Is this... now a super rare and exclusive item? At grade 100, Pixpet potions used to guarantee an egg would be found. Then in an update, their effectiveness was cut to 60% at grade 100. My guess is that, as of this update, Pixpet Potions are now 90% effective at grade 100. Can I get a definitive of how the Pixpet Potion works &commat;Komodo? So it’s rarity chance that’s determined by the grade? Yes of course, the higher the grade the higher the effect. I'm talking about the max effect at Grade 100. It basically increases the rarity chance in %. Thanks for the update on the potions!! Love the update, love that you guys listen to us! 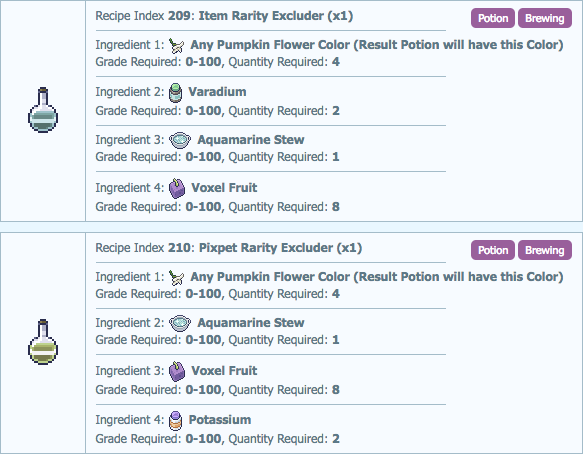 Excited about the pixpet potion, time to go brew another!